For physicians on the go. The DS-7000 sets a new industry standard in professional dictation equipment. Designed for professionals who rely on secure, flexible, reliable products as integral parts of their office workflow, it features real-time 256-bit file encryption, a redesigned, independently housed microphone, enhanced battery life and next-generation Olympus Dictation Management Systems (ODMS) software. The DS-7000 – Dictation … defined. The Olympus DS-7000 is being hailed as the new standard amongst professionals who consistently need to record their voice. Brilliant Color LCD: Many users of the Olympus DS 7000 love the large, 2-inch LCD that shows your recording time, battery level, folder, time left, and VU-Bargraph, or microphone level. You are able to view all of these while you are recording. Easy One-Hand Operation: The slideswitch was patterned after a micro-cassette recorder, so that with one control you can either Record, Stop, Play, or Rewind. A 3rd-generation durable accessory, you’ll love the precision you experience with the Olympus DS-7000. Total Workflow Integration: Users will quickly notice that the next-generation Olympus Dictation Management System, or ODMS, comes packaged with the DS-7000. You can send dictation to your transcriptionist sitting right next to you or miles away. 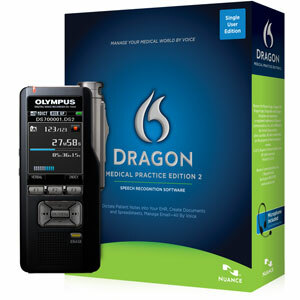 Furthermore, you can send for automatic transcription using Dragon® Medical Practice Edition. Improved Security Features: Many users will be excited to find out about the new security that really improves your use of the Olympus DS-7000. It is perfect for sensitive information, such as the medical dictation common in your day. The recorder can have a 4-digit PIN in place, and 128 and 256-bit AES encryption of each dictation file. Incredible Quality of Sound: Probably one of the most important components would have to be masterful sound quality. Innovative and super accurate, the microphone is independently housed. The benefit of this is that it reduces pickup of movements and also little bumps. The skilled sound reproduction comes with up to 16Khz/28kbps quality and 5-star accuracy when coupled with Dragon Medical Practice Edition. Included CR-15 Download/Charging Cradle: This convenient feature lets you automatically charge your recorder. For downloads, just place it into the cradle.